Give the gift of crafting to all of your galentines! Here in our studio, we feel that it is important to let your friends know how much you care and what a better way to do that than celebrating Galentine’s Day. Last year we showed our appreciation with these printable party invitations and invited our besties over for a fun craft night. 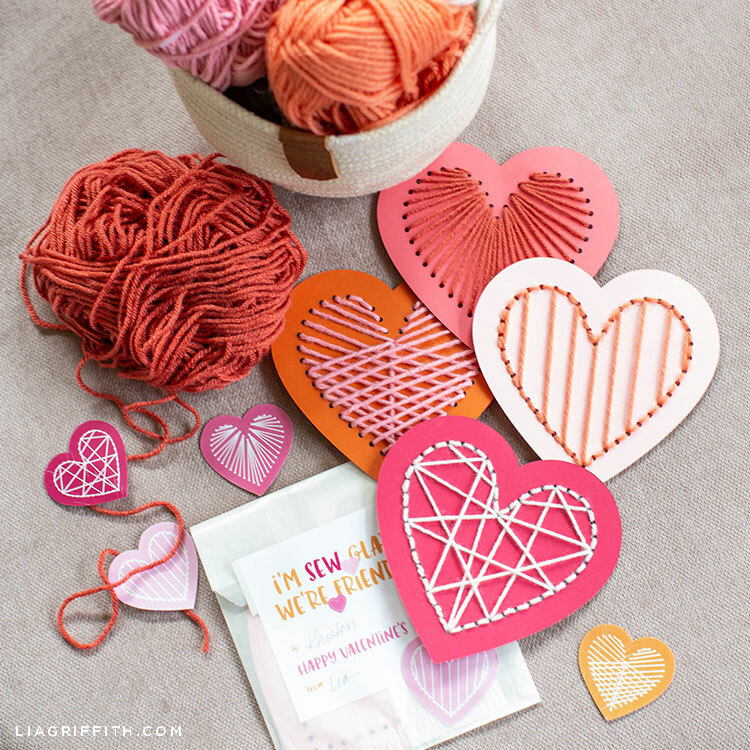 This year, we’ll show you how to create this heart lacing card Valentine craft kit to give to your favorite gal pals. 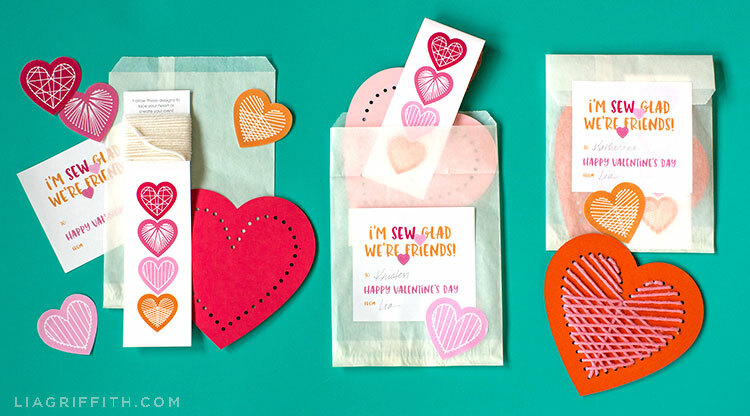 This sweet little Valentine’s Day craft kit is a great option for kids or adults who want to practice their hand-sewing skills. We used our Cricut cutting machine to cut our heavy cardstock into the heart-shaped lacing cards. If you do not have a cutting machine, you can simply trim the cards by hand and use a 1/8″ hole punch with the printable template download below. For best results, make sure the holes line up. Choose your favorite heavy cardstock colors and coordinate them with a pretty yarn. Make sure your yarn is not too thick to go through the holes. We found that worsted or sports weight yarn works best and you can find a great selection of colors at Knit Picks. I found that all of the designs here can be made with less than 4 yards of yarn, which easily wraps around the printed pattern card. Once you have picked your cardstock and yarn, gather the tools and the other materials below. 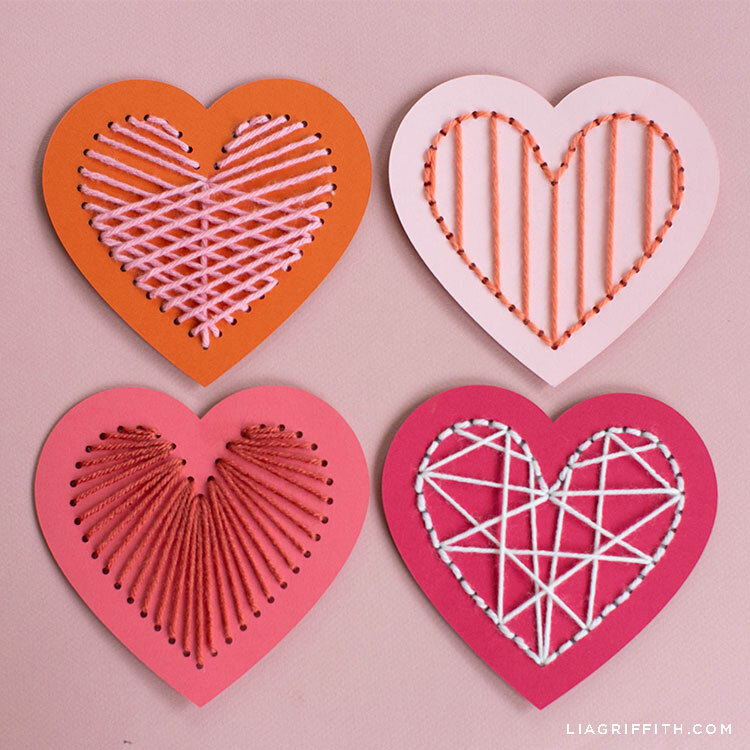 Then follow the simple steps to create your heart lacing card Valentine craft kit that you can hand out to friends during craft night. 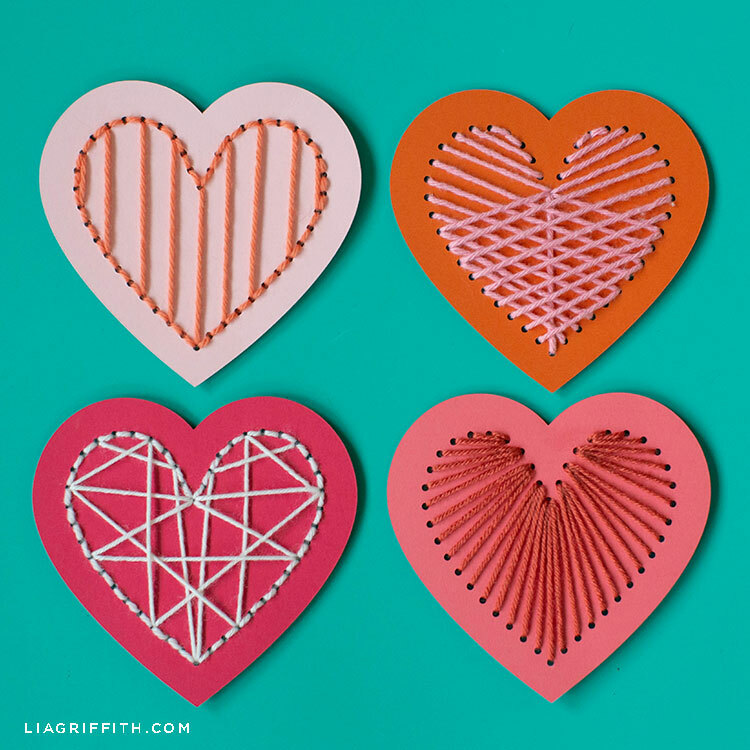 Cut your heart lacing cards from a heavy cardstock on a cutting machine or by hand (and use a hole punch). Print the Valentine label and heart sticker sheet on full sheet label stock. Trim the labels and heart with scissors. Print the card with pattern ideas on white cardstock paper. Wrap the top with yarn 4 yards of yarn. Wrap clear tape around tip of yarn to create needle, trimming tape to form a shape that will slide through the holes. Or include a large craft needle. Place heart and folded card with yarn into glassine bag. Add label and heart stickers onto bag. So wonderful to get these printable.